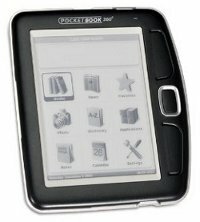 While the new PocketBook ebook readers are getting set to launch next month, the prices for the PocketBook 360 and PocketBook 301 have been reduced yet again. The PocketBook 360 (shown left) is down $40 to $159 for the standard package and $179 for the bundle package. The PocketBook 301 is now selling for $169 for the standard package and $189 for the bundle package. Standard packages come with the Reader, a cover, USB cable, and owners manual. The bundle packages include an AC charger, wrist lash, and a 2GB memory card, along with earphones for the 301. The prices still don’t appear to have taken effect from major retailers like Amazon, but PocketBook’s US website has them at the new prices. The US prices for the new PocketBooks hasn’t been revealed just yet, but the European pricing has. The PocketBook 902 and 602, along with the Tablet, are expected to start shipping the first week of November. The touchscreen models, the PocketBook 903 and 603, are expected to start shipping the third week of November.